A “Great Value For Money Offer” for Harbour Plaza North Point – Brought to you by Continental HK. Conveniently located in the Eastern District of Hong Kong Island, Harbour Plaza North Point is just one-minute walking distance to MTR Quarry Bay Station (Exit C), ten-minute away from one of the busiest shopping districts, Causeway Bay, five-minutes away from the renowned shopping centre “Cityplaza” and office complex of Taikoo Place. Offer is applicable to INDIAN MARKET ONLY, for NEW FIT BOOKINGS made on or after 20 MARCH 2015, for stay between 20 March 2015 to 15 July 2015, both dates inclusive. Rates are inclusive of breakfast as per booked occupancy. Offer is NOT applicable for groups. Minimum Stay of 2 Nights or more is required to avail the special rates. 01 FOC extra bed for child under 12 years old, additional buffet breakfast at USD 15 nett per child per breakfast. 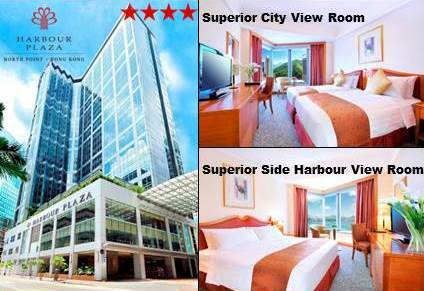 Pay for 03 nights stay at Superior Side Harbour View Room and enjoy complimentary use of in-room internet for maximum 02 devices. To download the details and rates of the offer, please log into your account through the Agent’s Section. It’s Raining Offers For Thailand !